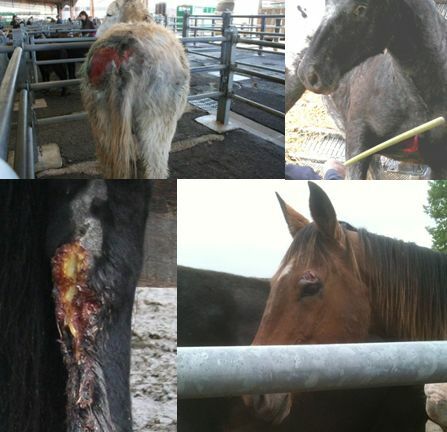 Over the last few months we have been investigating some of the larger horse markets in France. We have invested heavily in surveillance equipment to record the evidence we need to effect the necessary changes. If we do not film or photograph unseen, then we run the risk of losing information. We were noticed photographing the huge sore on the female donkey’s hindquarters (see below), and when we returned to look at her, she had disappeared. Armed with this information, we then take the appropriate steps to report offences witnessed to the relevent EU bodies. Our findings to date have been shocking. With a little more common sense applied to the needs of equines, many of the issues we encounter could be avoided. Some would be simple to implement – less overcrowding in the pens could prevent many of the injuries we witness. There is a clear disregard for many of the EU transport laws – highly unsuitable vehicles used for transportation (two ponies even came out of the boot of a car! 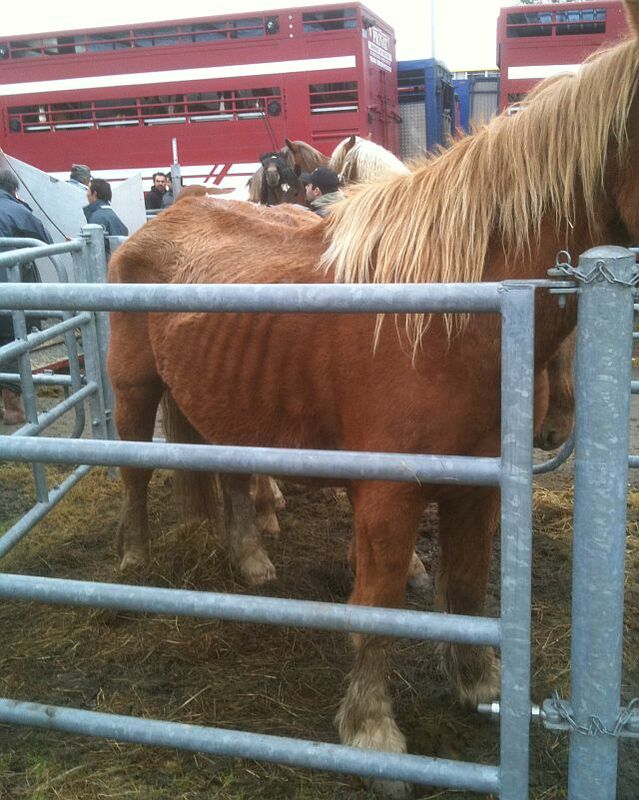 ), inhumane loading practices, mixing horses and donkeys, entires and mares with all ages and all sizes being crammed so tightly into vans that the doors needed a lot of force just to shut against them. Several injuries we saw were obviously from the horses being crushed against the ramp, or each other. Eye and lower limb lacerations were commonplace. There was no partitioning in many of the smaller dealers’ vans. It seems likely that the permitted journey times for the young heavy horses travelling to Italy are being exceeded. The market is at least 8 hours (maximum journey time for unhandled horses) from the Italian border, and many of the trucks originated from regions in the NE of Italy. We will continue to monitor, report and campaign for equines to be treated humanely within the current EU animal welfare laws. We cannot continue to do this without your help. We need you as our eyes on the ground to report cases to us, and as our financial support. Every little helps, so please consider making a donation to enable to carry on with our welfare work in France.